BJP leadership instead of fulfilling the Bodoland State has heavily bull-dozed on the existing ST communities of Assam by bringing an unexpected bill to grant ST status to 6 communities. The Bodo Movement group ABSU, NDFB (P), PJACBM and many other Bodo organisations on Tursday took out a rally at Rowta demanding Bodoland as separate state and revoke the bill of present form for granting ST status to 6 more communities of Assam. They also demand protection and justice to ensure political rights of Bodos living in Assam outside proposed Bodoland, grant ST (h) status to Bodos in Karbi Anglong & Dima Hasao . 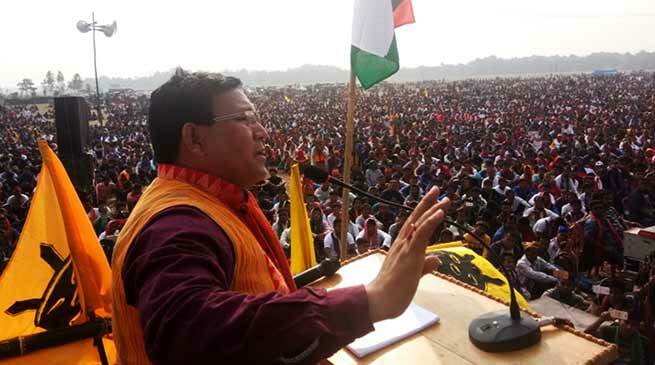 Talking to northeastindia24, ABSU president Promod Boro expresses deep concern about the lackadaisical and double standard attitude of the Government of India towards resolving the long-standing demand for creation of Bodoland state. The demand for creating Bodoland state in the northern part of the Brahmaputra curving out from Assam as per the Article 2 & 3 of constitution of India has been going on for the last fifty-two years, said Promod. The state and the union governments though having series of dialogue with the Bodo leadership is apparently seemed to be holding dialogue only for the ‘sake of mere discussion’ like game of duck and drake just to dupe the counter parts without having any political willingness, pragmatic step and clear-cut policy-decision to resolve the issue, said Promod Boro. Promod also alleged that ‘the BJP leadership about their verbal as well as written commitment (Election Manifesto of 2014) that they would resolve the Bodo problem immediately if they would be voted to form government in Delhi. We are surprised that the BJP government has totally forgotten their promises which we therefore condemn this act of their treachery’. The BJP leadership instead of fulfilling the Bodoland State has heavily bull-dozed on the existing ST communities of Assam by bringing an unexpected bill to grant ST status to 6 communities. The Bill is a serious threat to the very existence of the existing ST communities of Assam and if the Bill is passed and made an Act the existing STs will be totally crushed down socially, politically and economically, Promod said . How can the advanced communities with large number of population and the migrant people who do not fulfil the criteria for being ST be granted ST status? Promod raised the question ? The bill is completely unconstitutional, illegal, discriminatory and unjustified. The organisations of the existing ST will keep continuing its strong protest with tooth and nail against this draconian bill.